Next week, 15th Assembly District candidate Buffy Wicks is expected to release year-end finance reports that show a wide breadth of financial support for her campaign. That same support, however, is not yet translating to the local Democratic Party grassroots. Alameda and Contra Costa County Democrats in the party’s Region 5 gave only token support for Wicks’ campaign at Saturday’s state Democratic Party pre-endorsement conference in Berkeley. Local party leaders offered no endorsement from the current crowded field that includes 8 Democrats—10 total candidates—but that was expected. However, Wicks, a former political organizer and consultant for President Obama and Hillary Clinton, and who quickly raised over $200,000 through the June 30 filing period, received just 4 votes out of 79 cast. Twenty-eight delegates voted no endorsement in advance of the California State Democratic Party Convention next month in San Diego. Saturday’s results instead gave a snapshot of how local party leaders perceive the race, at this point, mostly viewed as up-for-grabs, not only for a potential early front runner, but also which candidates will advance in the top two June primary. 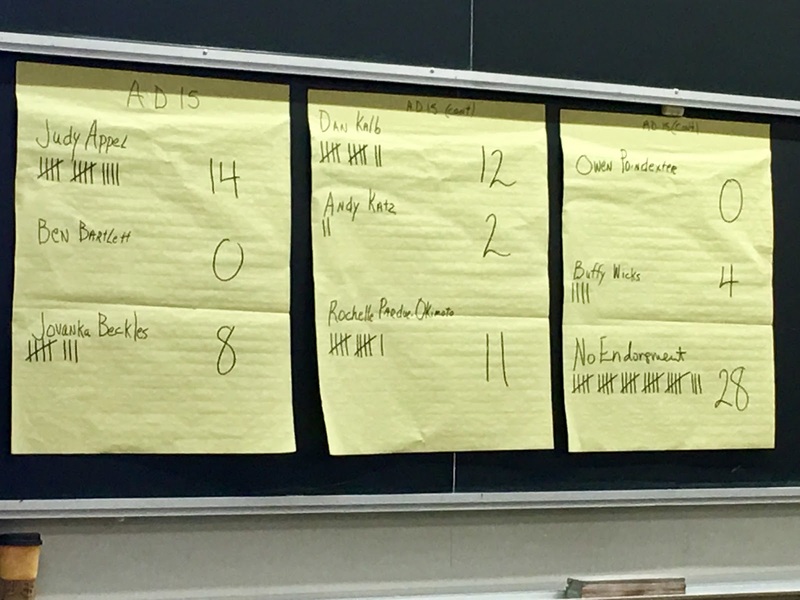 In a surprise, Berkeley school board member Judy Appel received the most votes of any candidate. In addition, her support appears to cover a wide swath of the district dominated by Richmond, Berkeley, North Oakland and parts in between. Oakland Councilmember Dan Kalb, viewed as a top tier candidate, garnered 12 votes. .
El Cerrito Councilmember Rochelle Pardue-Okimoto’s support Saturday was another surprise, receiving support from 11 delegates, including current 15th District Assemblymember Tony Thurmond. Pardue-Okimoto, a nurse by trade, also has early support from the powerful California Nurses Association. Richmond Councilmember Jovanka Beckles, who gave a stemwinding three-minute speech to delegates Saturday, received 8 votes, followed by East Bay MUD Board Director Andy Katz, who did not attend the pre-endorsement conference, with 2. Another surprise was the absence of support given by local Democrats to Ben Bartlett. The first-term Berkeley councilmember received zero votes. Tellingly for some Democrats attending the conference is the fact Rep. Barbara Lee voted no endorsement instead of supporting the nephew of her mentor, former East Bay Rep. Ron Dellums. Owen Poindexter, the self-described “basic income guy,” also was shutout of the voting. Posted in 2018 election, AD15, Alameda County Democrats, Ben Bartlett, Berkeley, California Democratic Party, endorsement, Jovanka Beckles, Judy Appel, Kalb, preendorsement, Rochelle Pardue-Okimoto. Bookmark the permalink.